My chicken butchery has definitely gotten more confident recently, and I’ve fallen into a rhythm with breaking them down. First I remove the whole legs (and yes, Alton, I make sure to include the oysters); this is much easier if you pop the thigh joint backward, and I’ve just been leaving the thigh and leg attached. Then I remove the breasts—a boneless skin-on cut allows me to do so without hacking through the spine, which has always been my biggest obstacle. Any tenderloin meat that falls prey to my learning curve gets removed separately in whatever little hunks I can manage, and frozen in a baggie of “chicken bits” for stir-fries, sautes, pizza toppings, etc. I’ve been trimming and freezing any livers that come with the chicken, to make into something when I accumulate enough; and I’ve even been saving the fat pads from the thighs with the thought of rendering them into schmaltz, for what ultimate purpose I really have no clue. The remaining carcass, of course, is frozen or roasted off immediately for stock. In any case, I’ve been doing separate meals for the bone-in whole legs and the boneless breasts, which allows me to try a wider range of recipes and at least feel like I’m stretching the chicken a bit further than if I had just roasted it whole. For this meal, I did a spin-off of a Brazilian or Caribbean dish of chicken braised with coconut milk and tomato. 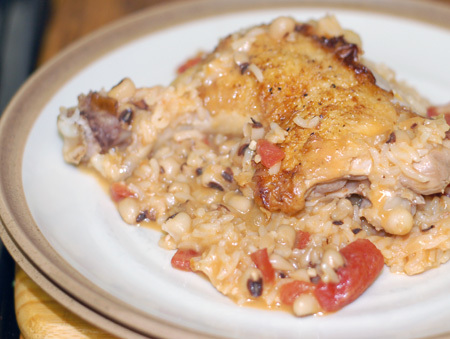 Since it is usually served over rice, I decided to cook my rice right in with the chicken and sauce, adding some pre-cooked black-eyed peas for an even heartier dish. The result was tender chicken on a bed of extremely creamy, flavorful rice and beans, not a far cry from the more famous Latin American staple, arroz con pollo. I should also note that the brand of coconut milk I used, Caribbean Joy, is virtually worthless, thin and watery without the body and rich coconut flavor that we’re used to getting in the Thai-labeled brands. It was the only option at the store I bought it from, but had I known what I was paying for, I would have waited and gone elsewhere. However, since I need to use it up, it served adequately in this recipe; you might consider using just half a can of the good stuff and supplementing the rest of the cooking liquid with a bit more stock or water. Most of the recipes I looked at included green peppers and cilantro with the sauce; I would have added a pepper if I had one on hand, but cilantro is my nemesis. This recipe serves at least 4; you could easily add in a few more pieces of chicken and another half cup of rice for this amount of sauce, provided you use a large enough pan. In a large (10-12″) saute pan, heat 2 T olive oil; add chicken, skin side down, and cook until golden brown on both sides. Remove to a separate plate; add onions, garlic, bell pepper and chili flakes if using, and cook for about 5 minutes, until tender. Add the rice, stirring to coat in the pan drippings; cook for a few minutes, until the grains are slightly toasted. Next, add the precooked beans, tomatoes, chicken stock, and coconut milk; stir to combine, and top with chicken. Bring to a boil, and then cover and reduce to simmer for about 30 minutes. The rice should be cooked, most of the liquid should be absorbed, and the chicken should be very tender. Serve garnished with cilantro, if desired. Source: Freely adapted from EzineArticles.com.